Our guest contributor this week is Pat Barch, the Hoffman Estates Historian. This column originally appeared in the September 2016 issue of the Hoffman Estates Citizen, the village’s newsletter. The column appears here, courtesy of the Village of Hoffman Estates. 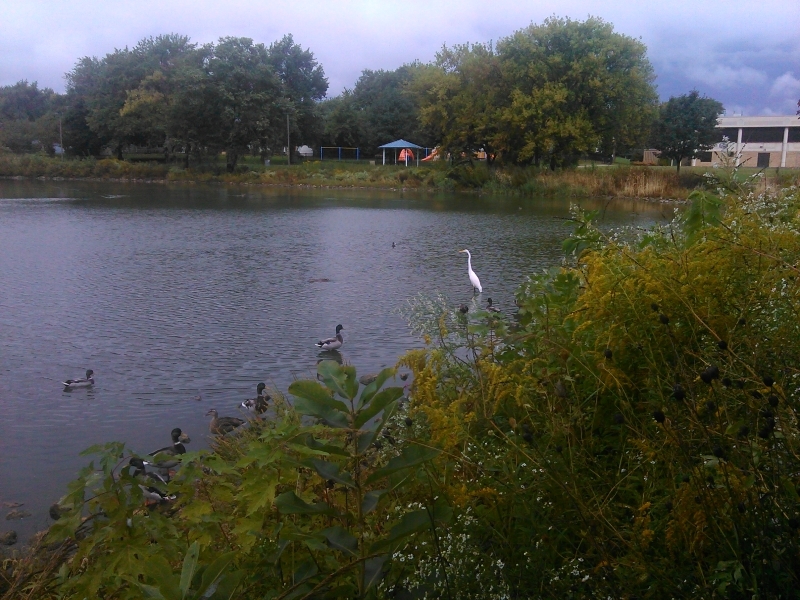 The retention ponds became places for fishing in the summer, enjoying the ducks and geese and ice skating in the winter. Eventually ice skating was limited to just a few ponds. With warmer winters and safety issues it was best not to offer ice skating anymore. 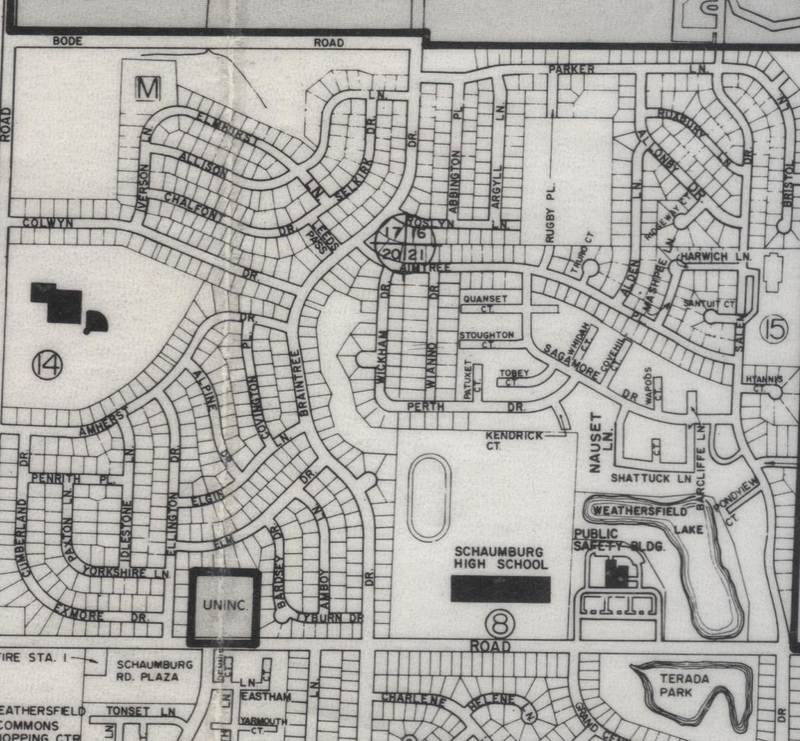 I wondered how many of the ponds were actual lakes that the developer found when he began to build the homes in Hoffman Estates. Looking at a National Geographic Survey map from 1953, I found the areas that did have ponds put in by F & S and other builders, were already wetlands that were natural choices for retention ponds and flood control. The only lakes I could find on the NGS maps were up north off Algonquin Rd: Whispering Lake Park off of Huntington Blvd., South Ridge Lake Park off of Fremont Rd. and Westbury Lake Park off of Dresden & Westbury Dr.. When you look at the map of Hoffman Estates and surrounding towns, you find these marked as lakes. All the other ponds shown on the Hoffman Estates portion of the map do not have names. They are the ponds that the developers planned into the area they were building to provide control of excess rain water and provide proper drainage for the neighborhood. It’s wonderful to have these ponds and lakes in our town. The parks that are part of the lakes and ponds are great places to visit on warm summer days. Some have playgrounds, others have walking paths but all are an asset to our village. In researching the newspapers for stories about the parks, I found a very funny story about the ducks and geese that frequent our park ponds and lakes. 50 years ago, in the Nov. 24th, 1966 edition of the Daily Herald, it seems that eighteen white ducks “of the domestic variety” were to be evicted from Lakeview pond next to Lakeview School. Lyle Button, Hoffman Estates Park Commissioner, was going to transport the ducks to Brookfield Zoo where they would be “happier”. He revealed to board members that “he had his course of action planned”. As parks Improvement committee chairman, he would buy several long handled chicken catchers. Four boys would assist him with the project. Did it really happen? I would have loved to be standing on the shore watching “the project” completed by those four boys. Was Mr. Button in the boat with them? I’ve not found another story that answers these questions. We know that a special variety of swans guard the ponds and lakes warding off unwanted ducks and geese. Mr. Button would’ve liked that I’m sure. Summer photo above, of the pond near Lakeview School, was graciously submitted by C. Blotteaux. This question was recently asked at the Reference Desk. In checking the aerial photographs that were covered on a blog posting a few weeks ago, you can see it on this circa 1967 image. Double click on the photo and locate the large black blob of Sarah’s Grove in the back, center of the photo. Follow that a little to the left and down and you can see the Florida-like shape of Volkening Lake. The lake is in the middle of what was formerly the Volkening farm property. You can make out the long lane that leads off of Schaumburg Road to the farmhouse and buildings. This was the home of Fred and Carrie Volkening. They were brother and sister who were born in Kansas but, in 1903, moved with their parents and other siblings to Schaumburg Township. Their parents, Henry and Emma, eventually purchased this farm near what is today the northwest corner of Schaumburg Road and Salem Drive. 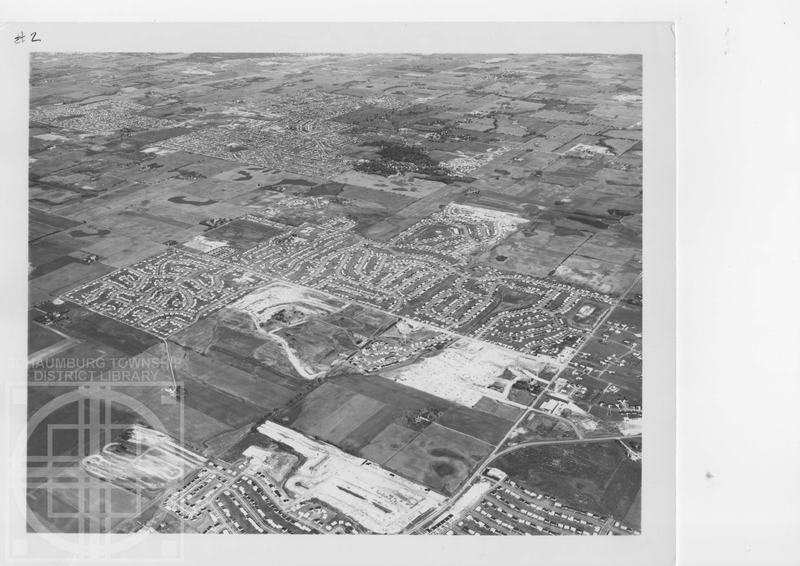 Given the fact that the 1967 photo above shows not only the lake, but also the farm before development encroached on the north side of Schaumburg Road, it seemed safe to assume that the lake was always there. To try and confirm this, I pulled out the topographical map from 1935. 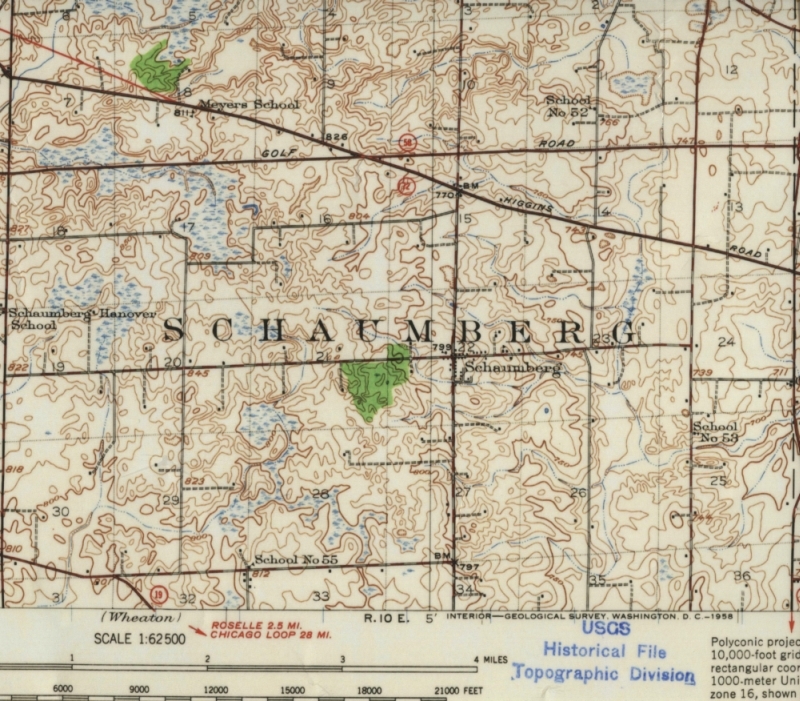 You can see the intersection of Schaumburg and Roselle Roads, Sarah’s Grove to the west of it and, then, just where the “H” of “Schaumberg” is, a blue portion that indicates a low-lying, marshy area that looks to be the early formation of Volkening Lake. But, it’s not a lake according to the map legend of topographical maps. It’s simply a low area that is not easily drained. I then turned to a series of aerial photos that belong to the library and started with 1949. There was no lake. Through the following years, in each of the photos, there was a big dark spot in the area that looked like the Volkenings were trying their best to grow crops despite the wetness of the soil. I moved through to the 1960’s and, in 1963, could definitely make out low ground in that area in the shape of the state of Florida–just like Volkening Lake. The photos then jump to 1970 and the lake is suddenly there. The farm is still there too. So, somewhere in the late 60’s-and towards the end of their farming days–the Volkenings stopped fighting Mother Nature and allowed water to fill in the area. It is probable that the Volkenings used drain tile in this low area for years to maximize their farm land to the greatest extent possible. By the time the Campanellis purchased the property it was probably fairly clear to them and village engineers that it wasn’t worth fighting drainage problems so they allowed the low area to be. The area around the lake was eventually developed by Campanelli into Weathersfield Commons quad homes and the lake was named Weathersfield Lake. 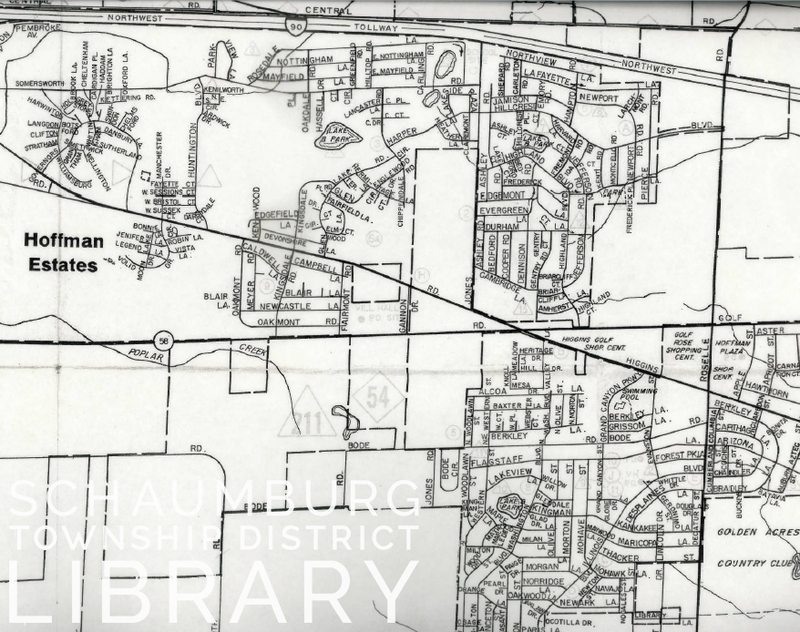 You can see that name on this Village of Schaumburg map from 1979. 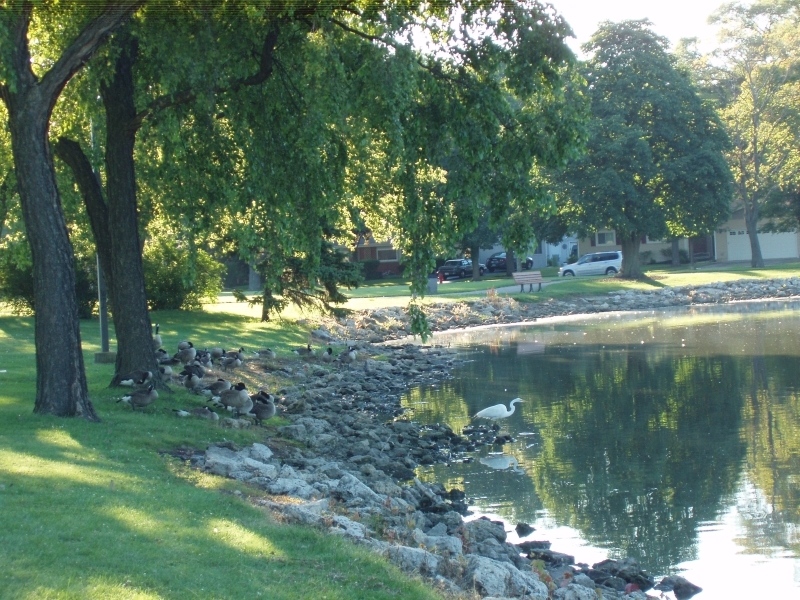 In 1980, Schaumburg Park District obtained $190,225 from the federally funded Land & Water Conservation Fund to help with the development of the lake. The work was completed in 1985 and, somewhere along the line, the lake was renamed Volkening Lake. It is used in a multitude of ways but the surrounding path has to be the most popular. It’s almost impossible to drive by in any type of weather and not see someone walking or running around the lake! The aerial photo was used with the permission of UTC Aerospace Systems.